Venture back to the age of the dinosaurs, and watch as the cutest big-eyed dinosaur babies emerge from their shells as you play 3D slots today! The background is an idyllic woodland scene, which serves as the dino crèche. You won’t be able to resist the adorable faces of these new-borns, who crawl past you on the reels as they explore their new home. The cute baby dinosaurs come in all shapes and sizes. My favourite was the long-necked purple chap, who reclines inside the remnants of his eggshell. Some of the other symbols include the mumma dinosaur and an unhatched egg. Founded in 1997, Eyecon is highly experienced games developers based in Brisbane, Australia. 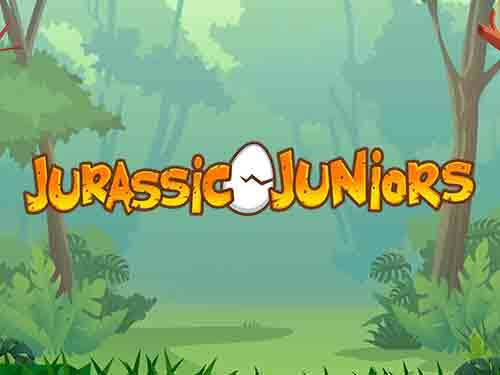 Eyecon has a reputation for simple, cartoon-like graphics and Jurassic Juniors Jackpot is certainly in keeping with this style. However this adds to the charm of the game, and the sweet characters are very endearing. For similarly cute games from Eyecon, we recommend trying Gets the Worm or Fluffy Favourites! Another Wizard game brought to you by Eyecon Gaming. This is a 5 reel, 25 payline slot with a progressive jackpot, meaning the more coins you put in the larger the jackpot will grow. 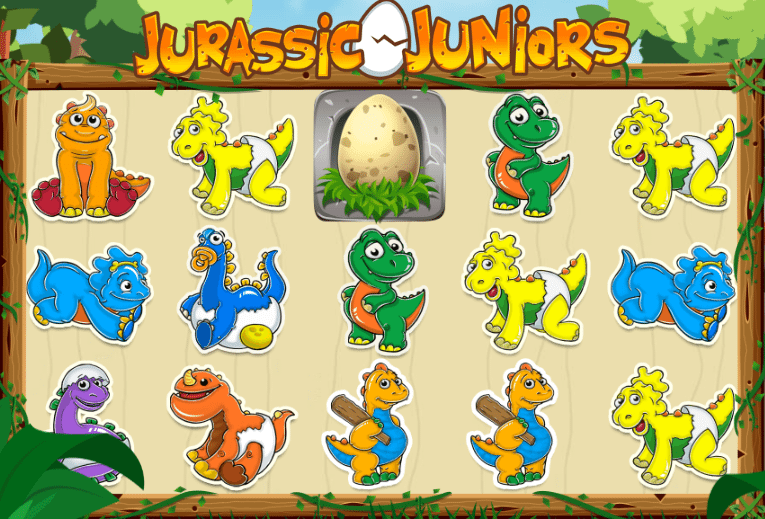 The minimum bet per spin is 0.25 and the maximum is 12.50, so you will be able to afford a playdate with these cute dinosaurs no matter what your budget is. Some of their best slot games have proven particularly popular in the UK market! Be sure to protect the unhatched egg as this is one of the most valuable symbols in the game. If three appear on screen at any time you will be rewarded with 15 free spins, during which time any wins will be tripled! 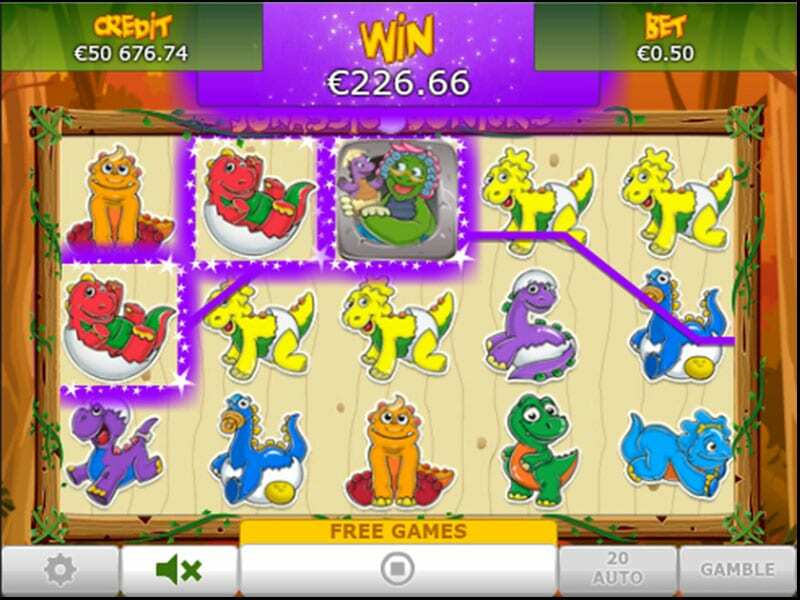 The mummy dinosaur is the Wild of the game, and she is always willing to give her babies a helping hand – she will substitute in for other symbols to help you secure winning combinations and even better, your winnings will be doubled if she features in a winning combination! She also pays out if you manage to get 2, 3, 4, or 5 mummy dinosaurs in a row – you will win 10, 200, 2000, or 9500 coins respectively! This game has an RTP of 95.44%, meaning for every £100 you pay in it will theoretically pay out £95.44. If you want to relax and enjoy playing with your new pals, an autospin feature is available for your convenience. The cute characters in this slot will steal your heart, but with an RTP of 95.44%, you don’t need to worry about them stealing your money! With considerable variation in how much you can bet per spin, a wide variety of players will be able to enjoy this game. There are no bonus rounds or gamble options available, meaning this slot is better suited to those who prefer simpler gameplay rather than complex bonus features. Fans of Eyecon can rest assured they have delivered another high-quality slot that will not disappoint.